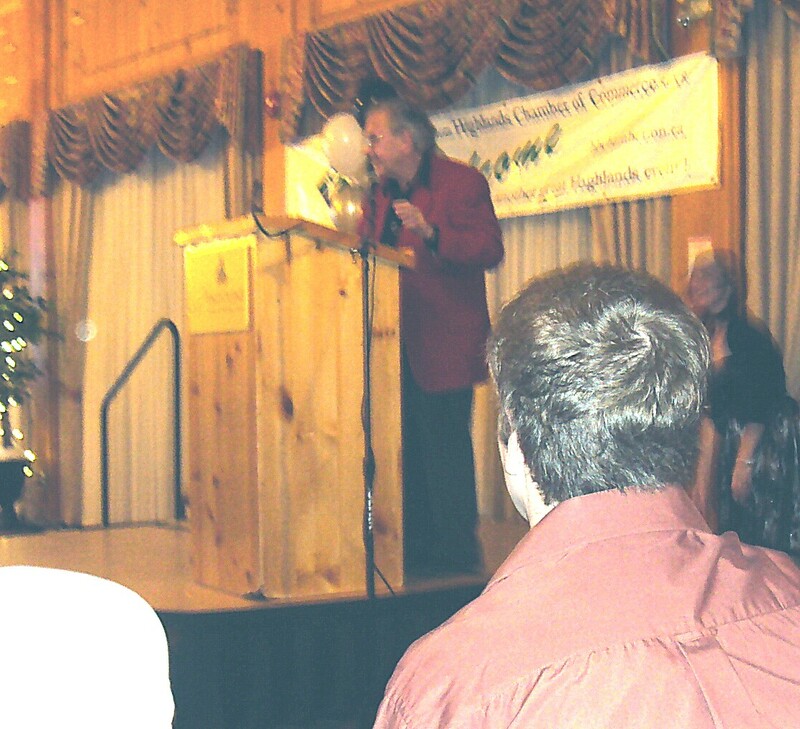 Last night the 5th annual Haliburton Highlands Chamber of Commerce “Achievement Awards” were handed out. 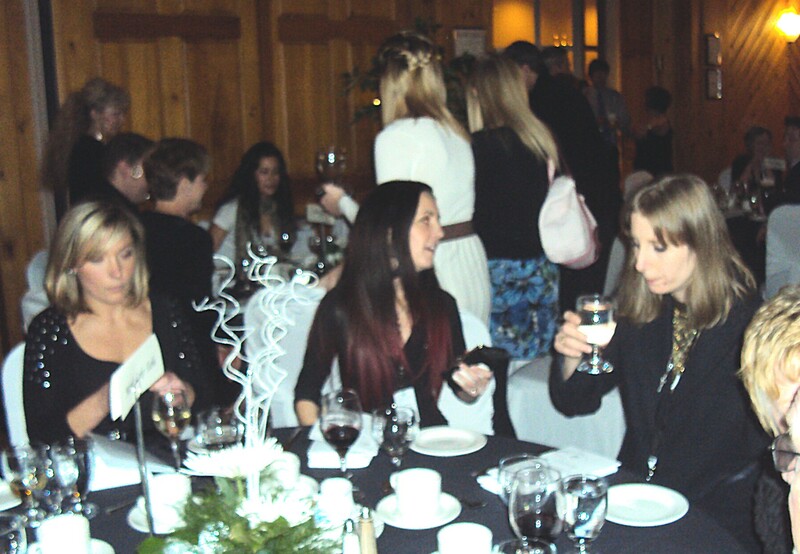 It was a packed house in the ballroom of the Pinestone Resort and Conference Centre and did we have fun. Such a big podium for such a small man! As Master of Ceremonies for the evening I am afforded fifteen or twenty minutes to review county events and people happenings of the past year. It’s a gentle poke at life in the Highlands. Apparently I said some funny things (they laughed a lot). Terri Crawford, wife of MPP Rick Johnson, said I reminded her of George Carlin. Wow, what a nice compliment. And she added, “He’s dead you know”. Slightly deflated I was. But I think the vote that counted the most, according to one lady, was the ladies washroom vote. Evidently, in the confines and solitude of that secret place, the gals gave me the two thumbs up. Jenn Watt, editor of the Haliburton Echo and Minden Times said my humour had a nice “cut” to it, but not so deep as to hurt. Thank you all. It’s an honour to be the MC of this event, and to be a part of the recognition process for so many businesses, organizations and individuals in our great county. The tenants from the Haliburton Creative Business Incubator were all in attendance. They were each nominated in the Entrepreneur of the Year category. Reports at the end of the evening was that they all had a wonderful time. It’s great experience for Karra (Haliburton Language School), Brandi (Wai Products) and Sandi (Why Not Collect It). The Chamber will have all the winners on their website, and the two newspapers were in attendance, so I’m sure the results will be on-line today and in the papers next week. The Chamber of Commerce received the Warden’s Award, celebrating its exceptional service to businesses and the county over the past 75 years. The Highlander of the Year Award (which I proudly recieved last year) was won by Scotty Morrison. Scotty is a kind and giving person who has contributed time and talent to many great and important causes in the County. Well done Scotty. I should close by saying that Eric Thompson and his committee, plus chamber staff (Kendra and Dennis) did a tremendous job on the arrangements and the program. I always judge an event by how it stays on its timetable. We finished on the nose last night. Well done all. And thank you to Frank and the staff at Pinestone for a wonderful venue and menu. Frank asked me to remind everyone …. prime rib roast beef is featured every Friday and Saturday at Pinestone. I love that guy. He knows how to promote. Plus, he knows “guys” from Hamilton. Say no mo’, say no mo’! Previous Previous post: The 2010 Christmas Card.